Free men and free women are smart creatives within their own ecosystems. They clean, they cook, they code and they blog in a ratio that is determined by individual calibers. They do so without any discrimination on the basis of gender or status. Doing all that they cooperate and form free families to change the world. They are never afraid of anything at all. Fear in changing any status quo is not only false but mentally retarding also. Fears make you mentally retarded and unnecessarily your masters are invented for bossing around you. 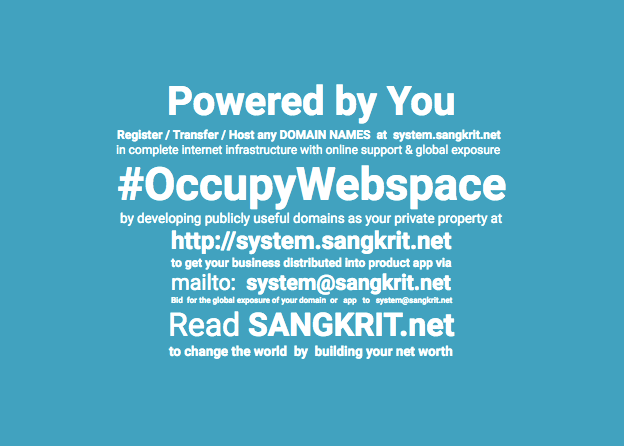 Sangkrit has configured the simplest way of humankind for going through internet age. Clean, cook, code and blog to become free forever!